Want to create a little surprise, some excitement, maybe even a little wonder in your next brochure? 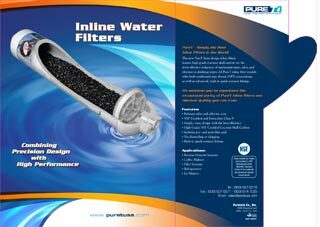 Look to Pure T's Carbon Inline Water Filters latest product brochure for your next great idea. Don't neglect to consider cool die cuts in your next printed piece because they are hard to design (and often more expensive). Think about the end result, when your customers say "that's cool" while looking at images of your products. Besides, if you can add value to your marketing piece with a die cut, why not do it and set yourself apart from your competitors? 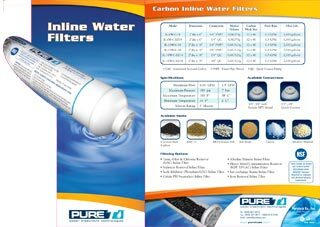 Pure T Water Treatment Technologies is a manufacturer and supplier of water purification systems and filters for residential, commercial, industrial and OEM clients worldwide. Pure T's prospects see lots of brochures and printed materials from competitors, especially at trade shows. How could they design their printed pieces to get more than a first pass or a quick glance? What could they incorporate into their design to leave a lasting impression? Product Images and Technical Specifications - The danger regarding data for technical products is information overload adding too much clutter and detracting from what's important. For this piece the designers included just the right data and product benefits that a prospective customer might need to make an informed decision. UV Coating - The UV coating on this brochure makes the images and colors really stand out. 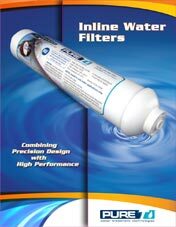 In addition, it protects the brochure and allows it to keep looking crisp and clean, especially at trade shows. The shiny UV coating can also add depth to a printed piece. Off center half fold die cut - This is the centerpiece of the brochure and the effect that makes it truly memorable. The designer really got creative in the way she created the effect - making the filter look as though it were cut in half to reveal the inside of the product. This die cut was difficult to produce, and it was done by a very experienced designer. The keys to getting a cut like this right are in the alignment, positioning, and having the proper bleed on the image. If you are working on a design that requires a die cut, give us a call and ask to speak with a designer - he or she would be glad to help. To give you a few helpful hints, but without getting too technical, design the die cut flat (in the instance you have to align the cut with a fold like this brochure) and make sure you use reference points for alignment. Thickness of paper - if you don't take paper thickness into account, your image could be slightly misaligned. Is there a coating, and how thick is it - the thickness of the coating could also cause misalignment if not taken into consideration. The contact information was placed at the bottom of every panel of the brochure that contained technical information in such a way that when the prospective customer finished reading the information, the phone number, email, website, and physical address would be there. To add credibility factors, the designer placed industry certifications and ISO 9001 designations around the contact information. Don't let the difficulty of die cutting stop you from giving it a try. Customers connect to designs visually with the piece when images pop out - you don't have to rely on text and flat images alone to connect with them. In this case, the product lends itself to a cool die cut. Your product or service may not - but be creative. If you were in the hotel business why couldn't you have a die-cut? Give it a try. Pure T's website states, "We don't just want to satisfy you, we want to impress you." 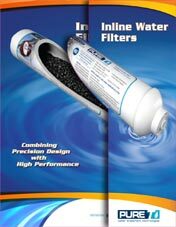 With this product brochure, they surely impress. The different panels showing the custom die cutting effects. An unusual aspect of this design is the fold on the right side of the brochure, so the traditional front is actually the back.